This rarely happens with musicals, but the reason to see this impeccably staged show is the director: Bill Condon, the man who arguably did the most to revive the movie musical with his script for Chicago (2002) and his script and direction of Dreamgirls (2006) (while also writing and directing such queer-themed films as Gods and Monsters and Kinsey). His love of musical theater is obvious, so it was probably only a matter of time before he entered the Broadway arena. With Side Show Condon successfully translates his storytelling magic to the stage. Side Show follows the true story of the conjoined Hilton twins, Daisy and Violet, who went from being attractions in the titular fairgrounds, to being the highest paid performers on the vaudeville circuit, and stars of the cult film Freaks. Condon brings the combination of polish and precision that marks his film work to bear, to impressive effect. Condon has worked with composer Henry Kreiger and lyricist/bookwriter Bill Russell to reshape the piece to be sleeker and more cogent than before (so I’m told, I don’t know much about the original production). Certainly a message – own who you are, whatever the world thinks – comes through clearly, without feeling preachy or trite. 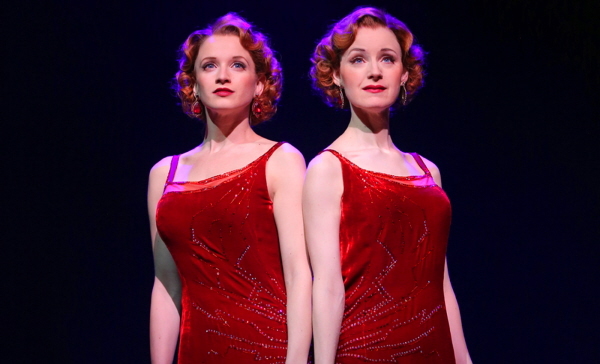 I do know that one of the most loved elements in the first production was the chemistry between the women playing the twins, Emily Skinner and Alice Ripley. Here Emily Padgett plays the fame-craving Daisy and Erin Davie as the shier and more retiring Violet. They blend beautifully, communicating that essential sense of twin-ness, while creating decisively individual personalities. I can see what people saw in the original, but I’m even more impressed at the grace with which Condon has applied his gifts to the stage. Recommended. In this riveting evening of lip-synch, there’s a lot of people up on that stage, even though there’s only two bodies. John Epperson lip-synchs an interview Joan Crawford gave in 1973 in New York’s Town Hall. Or is it Epperson as his drag persona Lypsinka as Crawford? Not to mention that some of the additional audio is Faye Dunaway portraying Crawford in Mommie Dearest, and some other cues are extracted from films where Crawford is portraying yet another “somebody else.” And then there’s the interviewer, lip-synched in most performances by Steve Cuiffo (Hairspray lyricist and generally brilliant man of the theatre Scott Wittman will perform the role November 18 through December 1). Epperson provides further, fruitful complications. This is no straight-up impression or imitation. Instead, Epperson’s gestures and expressions provide a constant, running commentary on what Crawford’s saying – and what she isn’t. For example, whenever the subject of “the children” comes up, Epperson executes an almost ritualistic dusting of the hands. Epperson has structured the evening so that it does indeed play like a passion play, an “imitation of the Christ,” with spiritual themes, struggles, and, finally, uplift. In a costume by Ramona Ponce and crimson jewelry by Robert Sorrell, Epperson resembles a particularly regal and sanguine version of Crawford. The interview might be the centerpiece, but the keystone of this show is Crawford’s reading of Max Ehrmann’s prayerful poem “Desiderata”, which opens with: “Go placidly amid the noise and haste, and remember what peace there may be in silence. As far as possible without surrender be on good terms with all persons.” Not qualities often associated with Crawford’s persona or reputation. This is lip-synch as high art. Highly recommended. I really loved this revival of Rodgers & Hammerstein rarity Allegro. It’s not an unarguable classic like their South Pacific, or as rock-ribbed in structure as their Oklahoma! or Carousel. It’s weirder, and in some ways more ambitious, than any of those – already enough to gain it a place in my heart. On top of that, director John Doyle’s stripped-bare production reveals its considerable virtues, and, for me anyway, secures its place in the R&H canon. Allegro’s head is in the future, while its heart is securely in the past. The only other musical theatre composer of the 1940s that was in Rodgers & Hammerstein’s league was Kurt Weill (one could even argue that he was doing better work than them, but that’s an argument for another time). Allegro can definitely be seen as their attempt to out-Weill Weill, all presentational style and big ideas. The story of Allegro follows the story of one Joe Taylor, Jr. (the seriously handsome Claybourne Elder) from cradle to early manhood in the early years of the 20th Century. His story is even more conservative than Oklahoma! and Carousel – which were the two big R&H hits immediately preceding Allegro – detailing the inexorable pull of small-town virtues over the fast-paced “allegro” of the big city. One of the most successful American plays of all time, Our Town, utilized much the same combination of presentational aesthetics and small-town subject matter. Indeed, Rodgers and Hammerstein may have had Our Town in mind when writing Allegro. However, there’s an element of unsentimental objectivity about small-town America that is absent in the more sentimental Allegro. For these reasons and more, Doyle’s minimalist take on Allegro hits all the right notes. His gimmick of having actors play musical instruments has been seen before, in productions where it was both effective (Sweeney Todd) and ineffective (Company). 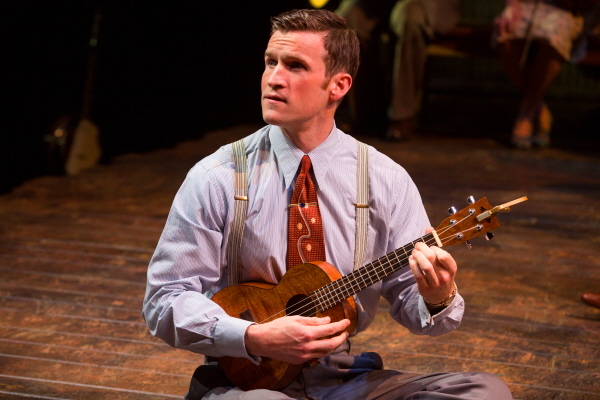 It is more effective here than ever before, as the cast plays such homey instruments as guitars, fiddles, mandolins, banjos and upright pianos. This turns Allegro‘s conservatism into a virtue, fully owning the sentimentality and turning the folksiness all the way up. What may have once seemed like merely an intellectual exercise now actively pulls on the heartstrings. Highly recommended. The artist otherwise known as Lypsinka takes off the wigs, makeup and sound design, and – lo and behold – is still an engaging entertainer without all that. Sure, John Epperson sans the Lyp armor is a very different sort of performer, but his much more traditional cabaret act Show Trash holds the stage, with considerable grace. Show Trash is in many ways a Lypsinka origin story, showing how this small-town Mississippi boy eventually blossomed into an emblem of all that is worldly. It takes a few songs before we turn to his childhood on Hazelhurt, Mississippi (2010 population: 4,009). This is a good thing – one of Epperson’s great gifts is his ability to reveal hidden dimensions using surprising juxtapositions. Though that gift is used with more subtlety that in the Lypsinka shows, it still gives freshness to an essentially autobiographical act. Epperson gives us a more exposed, vulnerable side of himself in Show Trash. 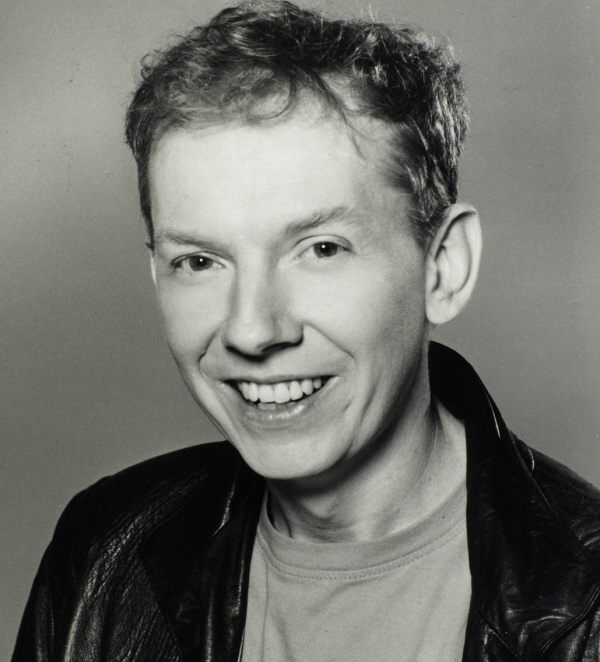 He reveals that Lypsinka’s brashness comes in part from a desire to mask his own reticence about performing (he’s gotten over that: in addition to this show, Lypsinka has made increasing numbers of appearance in “straight” plays). In the show, Epperson accompanies himself on piano. His first notable artistic efforts were on the piano: he was a rehearsal pianist for American Ballet Theater in the 1970s and 1980s, playing for the likes of Baryshnikov and Marakova. While this provided him entree into a world he loved – he tells many engaging stories from those years – it stifled his own creative impulses. From this unmet need sprang Lypsinka. There are glimpses of the Lyp, as Epperson’s lip-synchs to some Hazelhurst favorites or flashes a particularly sharp hand gesture. 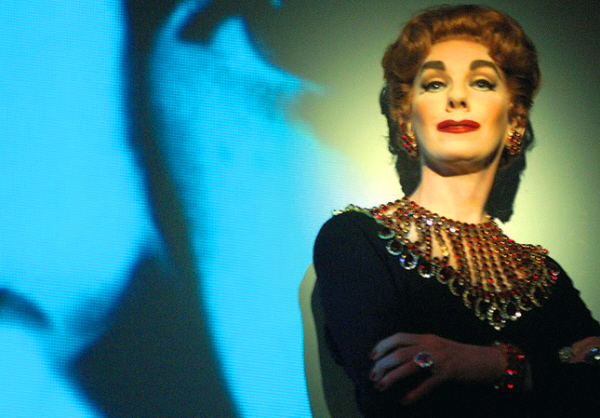 Barry Kleinbort is the one of the great masters of cabaret direction, and his sensitive work here includes the supple use of home movies and photos to reinforce Epperson’s story. Highly recommended. Lypsinka long since turned the drag queen craft of lip-synching into high art. In The Boxed Set, the artist otherwise known as John Epperson refines and reconnects the various pieces he has been doing since the 1980s, in a sort of greatest hits collection. He has done this compilation before, and this time around the thematic strains about identity, gender and madness have just gotten clearer and stronger. Thank goodness, though, that increased clarity has done nothing to diminish the fundamental strangeness of the Lyp’s audio collages. One of the great pleasures of Epperson’s brand of lip-synch is the way it doesn’t so much tell a story as paint a picture. An Ethel Merman outburst next to a Dolores Gray tune, next to Faye Dunaway channeling Joan Crawford, next to the Crawford herself, next to a Vegas bopper you’ve never heard of – these juxtapositions are the very things that make both the surrealism and the sharp insights happen. Those things, and the very precision of the lip-synch. You can’t do the things Lypsinka does without meticulous attention to the basic craft of lip-synch, and her talent in this arena is unparalleled, awe-inspiring. And Epperson’s background in dance just adds to the meticulous construction. Sometimes Lypsinka will play a moment straight, but just as often she takes a wisp of irony in the original and puts it under a magnifying glass with a look, a sneer, or even a limb that seems to be rebelling against her brain. But never doubt that even that rebellion is under Epperson’s laser-sharp control. What can I say? This is 5-star, 10s across the board, the gold standard of drag queen artistry. This gets my very highest recommendation. What haven’t you bought your tickets yet? For those tickets, click here. This play has a reputation as being one of the most accessible plays by the notoriously cerebral British playwright Tom Stoppard. I understand why, since the love story at its center, despite many intellectual and moral turns, ends up being rather sweet. Still, as much as I found to enjoy in The Real Thing – and as much as I certainly appreciate Stoppard’s insights and intelligence – if this is Stoppard at his most accessible, I’m truly never going to be his biggest fan. It’s a tricky business balancing these people’s crisp exteriors with the constantly shifting feelings underneath, and McGregor and Gyllenhaal do a decent job of playing surfaces against depth. Nixon also makes a solid impression as Henry’s haughtily smirking, somewhat older wife. Sam Gold’s direction tends toward the cool and restrained, which has the benefit making moments of deep emotion stand out in sharp relief. The reputation I mentioned above is definitely earned – this is a significantly warm play from the author of such flinty pieces of intellect as Jumpers or Travesties. Perhaps seeing Stoppard’s even more emotionally engaging Indian Ink very recently has made me extra alert to the cooler colors in The Real Thing. 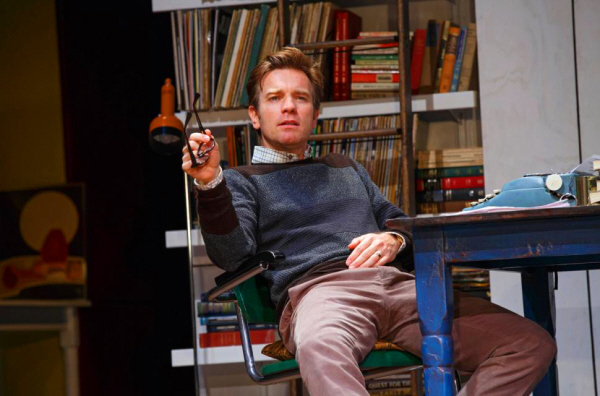 On balance, if you’re a Stoppard fan, The Real Thing is not to be missed. If, like me, you’re not, it’s interesting but certainly not essential viewing. This production of Mozart’s Masonic fairy tale Die Zauberflöte (The Magic Flute) is truly spectacular – then again, the director is the visionary Julie Taymor who can do “spectacular” in her sleep. Mark Dendy’s choreography brings some real sexiness to the proceedings, and the singers in this Metropolitan Opera production are quite wonderful (more about a couple of them in a minute). And Mozart is without a doubt one of the best opera composers of all time. So why did I find this production oddly deflating? Upon reflection, I realized the culprit was the libretto by Emanuel Schikaneder. It wasn’t as good as I remembered: its attitude towards women is terribly misogynistic, even for the 18th Century, and the part of the libretto that had lived so strongly in my memory, its mysticism, now seems thin and a little false. So, the opera hasn’t changed, but I have – I ask a lot more from mystics than I did as a teenager. The good news: Mozart wrote more beautifully for woman’s voices than almost any other composer, so Schikaneder’s stereotyped lyrics for the big arias are transformed into fully human moments. 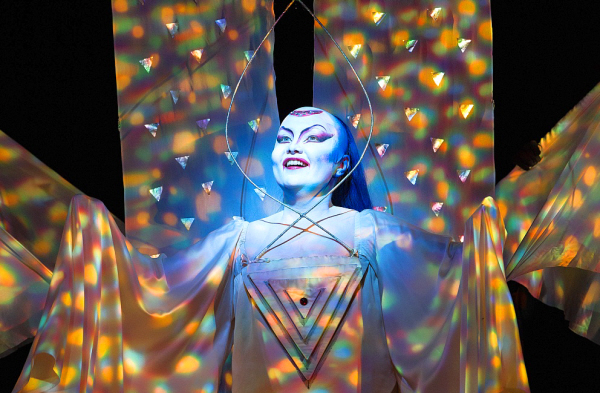 Sometimes more than human: the Queen of the Night’s second-act showstopper “Der Hölle Rache” is the articulate, even elegant scream of a wronged goddess. We are in the land of mythic archetypes here, and soprano Kathryn Lewek delivers a hair-raising performance with immaculate technique and chilling precision. So too, when our heroine Pamina laments her alienation from her love Tamino, her aria “Ach, Ich Fühl’s”, Mozart fills the moment with real ache. And again, the soprano charged with signing it in this production, Miah Persson, gives it a full, beautiful reading. I recommend this production, even if the opera itself isn’t all I remembered.